An autonomous bus that parks itself! Take a look. March 30th, 2018 was an important day for the future development of autonomous buses. 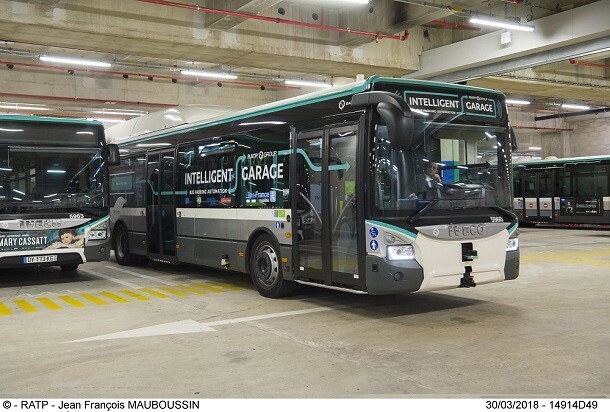 Indeed, the RATP group (the Autonomous Operator of Parisian Transports), in partnership with Iveco Bus and the CEA List, succesfully showed a bus park autonomously (without any human intervention). It is a first in Europe. The tryout took place at the bus center of the RATP, in Paris, France. It took place on two times. The first test was to automatically start the vehicle (Iveco bus) then have it come autonomously from its parking spot in the underground parking lot to the exit at the center. The reserve operation has then been tested : from the center, the smart vehicle goes to park in the underground parking lot to the place given by the fleet management system. What are the advantages of such solution ? From the RATP's point of view, this system offers several advantages, in particular a more effective management of the available spots in their yard. Indeed, the automation of the parking phase of vehicles will optimise the space in between each bus.The advantage is even bigger for parking lots in cities that cannot be expanded to have more vehicles. The other strong point that stands out in this tryout is the improvment of working conditions for drivers. Such features make this job even more attractive. The drivers won't have to park the buses anymore, that they usually do at the end of their service when theyr are the most tired.